Sportsbook with a vast range of pre-match and live betting options. Bet on football, baseball, tennis and place binary bets on global financial markets. Play progressive, 3D and live slots from leading developers such as Betsoft. 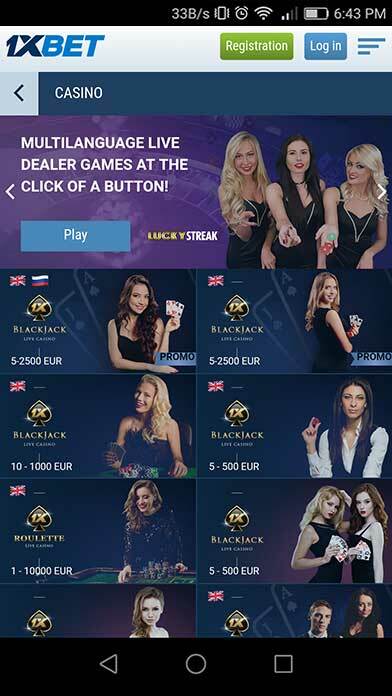 Live casino staffed by real dealers with blackjack, roulette and poker. This online casino has years of experience and provides a range of products and services including: sportbooks, arcade, casino games: slots and live dealer games. 1xbet started life as a high-street bookmaker in Russia, and it still has 1,000 high-street shops. However, it is now a global online-gaming giant that provides sports and casino betting to a wide-range of countries around the world. Players can reach the helpful and friendly customer support team via online contact form, email, phone and live chat, which is open 24/7. If you have been looking for an online sportsbook and betting website that has it all, then look no further. We are here to present you the all-in-one sportsbook and casino website: 1xBet. Here you will find it all, whether you like to spin the reels of slot machine or bet on your favourite football team. Players looking for a new sports bonus can claim a 100% first-deposit bonus of up to €100. Wagering requirements state you must wager the bonus on a minimum of 3 accumulators each containing at least 3 selections with odds of at least 1.40 (2/5). 1xBet offers a large number of casino games from some of the biggest and best names in the industry as well as some up-and-comer firms. This is good because it means that while you will be able to enjoy the very best games on the web, you will also have the opportunity to try new titles you may not have played before. For those who have played the big name games endless times, this provides a chance to try something novel. Playtech – UK firm Playtech is among the biggest and most respected casino software firms in the world. This firm is so huge it’s traded on the London stock exchange and has a long history of producing world-class slots and other casino games. You can enjoy some of Playtech’s best releases at 1xBet, some of which we will cover a little later in this review. NetEnt – Another huge name in the online casino industry, you would have to be totally new to the industry to not at least know about NetEnt. There are a few big names that stand head and shoulders above the other game producers out there, and NetEnt is one of them. Be sure to check out Starburst and Gonzo’s Quest at the very least if you decide to play at 1xBet. Microgaming – UK software firm Microgaming has been around since the very beginning of online casino gaming, and this experience makes for some of the best casino games you can find on the web. This is the final of the ‘Big 3’ software providers, including the two mentioned above, and seeing all 3 at 1xBet is definitely a good sign. Be sure to check out Hitman and Immortal Romance at the very least. Play n Go – Play n Go isn’t quite as big as the others mentioned above, but that doesn’t mean its games should be dismissed, either, and there have been lots of great slots put out by Play n Go over the years. We recommend having a spin on Energoonz and Aztec Idols at 1xBet. There are lots of games from other providers like Playson, Betsoft, Novomatic, IGT, and others, too. Try to be able to different and unique with your marketing.